I realized the other day that I’ve been guilty of doing a very similar version of what the ATP (and/or the events, or whoever it is that owns it) does with their Hawkeye data: collecting information about tennis matches that’s not available anywhere else…and not posting it for others to see. Last week I collected Consistency Rating information for Roger Federer’s matches against Florian Mayer in the Hamburg quarterfinals and against Federico Delbonis in the semis. 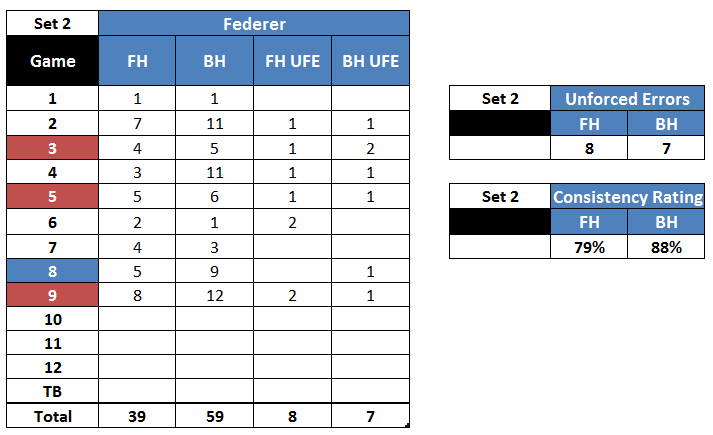 I was curious to see how Federer’s numbers would fare with the new 98 square inch racquet he debuted at the former Masters 1000 event, particularly when comparing them to the other match I tallied numbers for, Roger’s loss to Kei Nishikori in Madrid. Hence, without further ado, here is all the data compiled for both the Mayer and Delbonis matches. I’ll write a few observations under each, but feel free to submit your own conclusions in the comments section below. 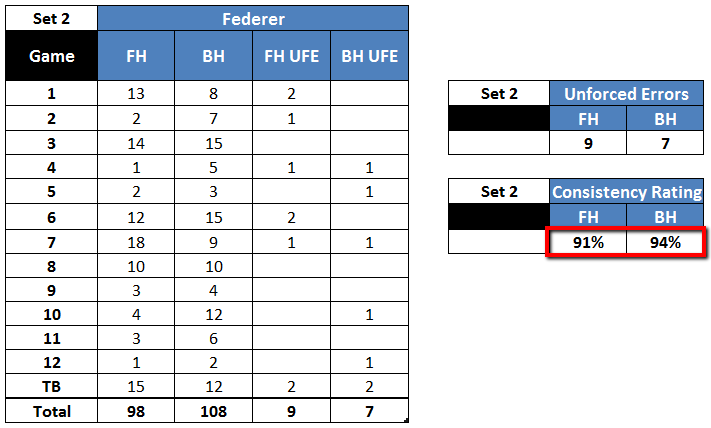 – Notice the huge disparity in the forehand to backhand ratios in Federer’s service games and return games. He breaks even when returning, but hits way more forehands than backhands during service games. Naturally, this is due to the fact that his all-time-great serve usually affords him the opportunity to start a rally on his own terms, preferably with a forehand from the middle of the court. On the other hand, a significant portion of rallies during Federer return games start with a second serve directed at Federer’s backhand. And since the Swiss tends to simply slice back returns off that wing, the opportunity is there for his opponent to direct his first shot straight into Federer’s AD court. – A 93% Consistency Rating with your weaker wing for an entire 3 set match is truly remarkable. More on that later. 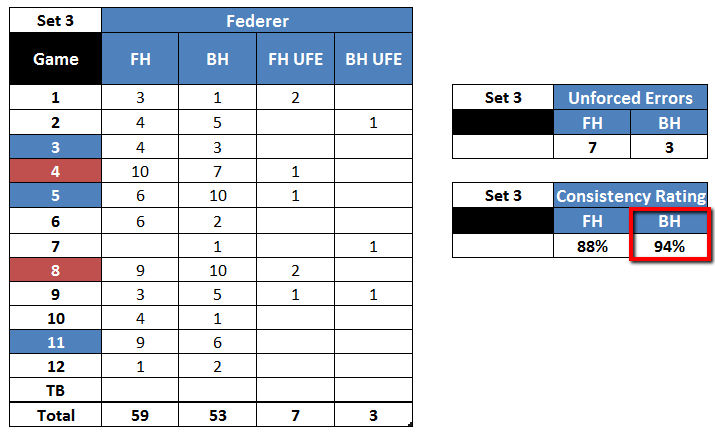 – The games highlighted in red mean Mayer breaks of serve, while the game highlighted in blue means a Federer break of serve. – Predictably, Federer had his worst Consistency Rating numbers in this set, which will always be remembered for a certain vest. The Swiss was presumably frustrated and rattled by his back ailment, and Mayer didn’t show any letdown after losing that tough first set. – Notice how the Consistency Ratings went up for this set, and how good the backhand was. Still, Federer had to work more during his service games than in his return games (he had to hit around 20% more shots when trying to hold serve), and while he broke serve three times, he still got broken twice. – Federer’s back started to give him trouble at some point in the first set, prompting the immortal VestGate of the second set. Hence, it’s no surprise that Federer had to work way more during his service games than he’s used to – to the point that he was having to hit more shots during them than on his return games, a pattern that’s uncommon for him (as seen in the Nishikori match in Madrid). – Supplemental information: Federer served only 58% of 1st serves for the match (I wish I could see the set-by-set splits, but those disappear once the tournament is over), won a healthy 73% of 1st serve points, but only 45% of 2nd serve points. The most problematic stat might be this one, though: Florian Mayer won 59% of points played with his mediocre second serve. – Notice how good Federer’s Backhand Consistency Rating is. That wing was extremely solid during the Mayer and Delbonis matches, even though it showcased the usual problems Roger has off that wing: frequent lack of depth, inability to be aggressive with down the line backhands, and neutral second serve returns off that wing. – The forehand was more problematic, and who knows how much of these struggles were due to the new racquet and how much was due to the back ailments. What I did notice in both matches was that Federer was struggling to get depth with his forehand, even when he had ample time to set up and swing freely. Usually when Federer has time to unleash a forehand, the ensuing shot is deep and piercing. In these two matches, that wasn’t the case in a worrying amount of attempts. – I thought Florian Mayer made a crucial mistake in this match: he didn’t realize that Federer’s backhand was extremely solid, and he kept trying to use the usual tactic of trying to grind that shot down. However, he forgot that to make that strategy effective, you have to vary your spins and try to get Federer to cover his forehand side a bit. The big issue for Funky Flo was that his own crosscourt forehand is a very suspect shot, which surely doesn’t help. – Do notice that hilarious forehand to backhand ratio during Federer’s service games of that first set. 30 more forehands than backhands! And notice how that’s reversed during Federer’s return games. – This is where you can see Delbonis’ gameplan come to life: taking advantage of his serve, he directed most of his shots to Federer’s backhand, but kept rallies short by attacking Federer’s forehand corner as soon as he could. – Notice just how effective Delbonis was at forcing Federer out of his forehand comfort zone during his return games. The key here is that Delbo didn’t make Mayer’s mistake of waiting out for a backhand error: instead he waited for short balls to attack Federer’s deuce court with. 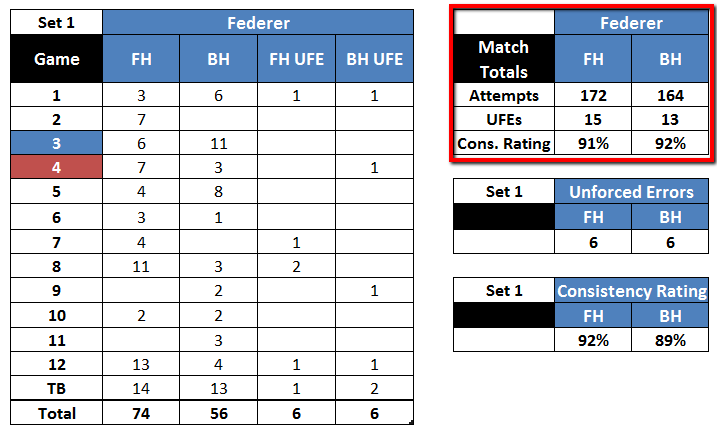 – Roger Federer’s issues weren’t related to Consistency Ratings in this match, no? Posting a 91% Forehand Consistency Rating and a 92% Backhand Efficiency Rating would probably give you a good chance to win a match on most days (and even more remarkable when you factor in the back issues). It’s a testament to Federico Delbonis’ performance that Federer came out of this match empty-handed. – That being said, notice the most worrying trend: Federer once again had to work harder during his service games than his return games. 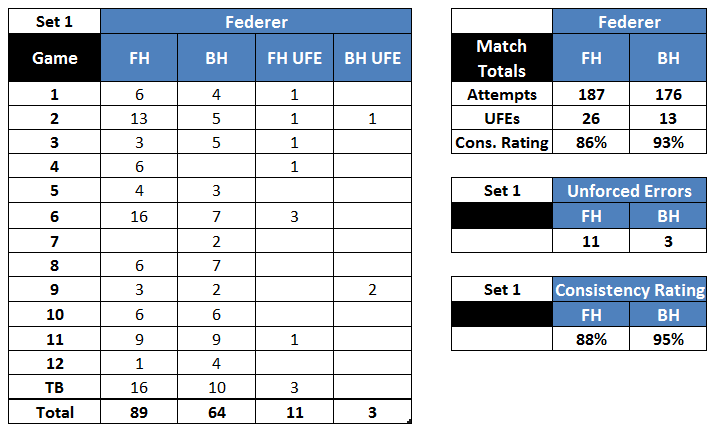 – Supplemental information: Federer served only 57% 1st serves in this match, but won a stellar 78% of those points. However, he only won 53% of 2nd serve points. But just like in the Mayer match, the most worrying stats come on the return side: Delbonis won 82% of 1st serve points, and 68% of 2nd serve points. Keep in mind that while Delbo is 6’3, his serve is not that imposing. Plus, we are talking about a kid who had never made it inside the top 100 until last week. Again, feel free to leave your own conclusions in the comments section below. Do you spot a trend I missed?